Cwm Pennant. 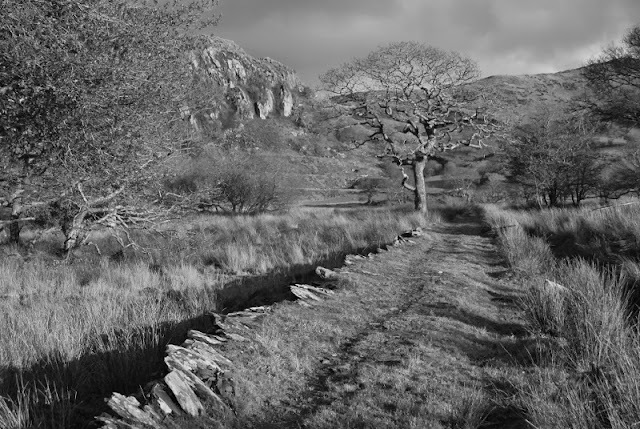 That beautiful, haunting cwm that rises from the hamlet of Dolbenmaen, past the vain glories of Huddart's folly(b) and the rocks of Craig-y-Llan, following the Afon Dwyfor until the mountains close in ominously around. At the head, the mist shrouded citadels of Mynydd Tal-y-Mignedd and Trum-y-Ddysgl stand above the shattered ruins of slate quarries and deserted farms, echoing to the cries of Raven and Buzzard. And the life of an old shepherd so short?" 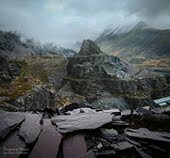 And I agree, the cwm is indeed beautiful, yet, for me, it has an ominous feeling, as if something terrible is about to happen. It is a trick of the landscape, no doubt, but I have felt this every one of the many times I have walked along the valley. 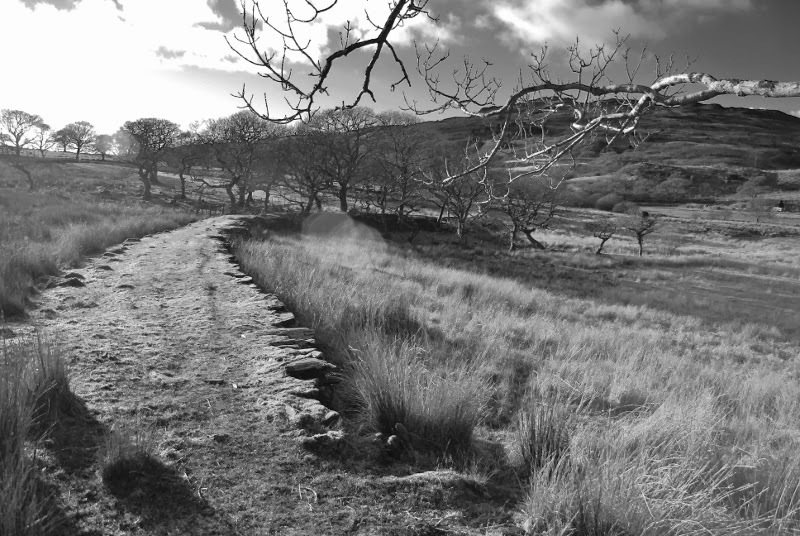 Here is a landscape where every field corner is thick with ghosts. 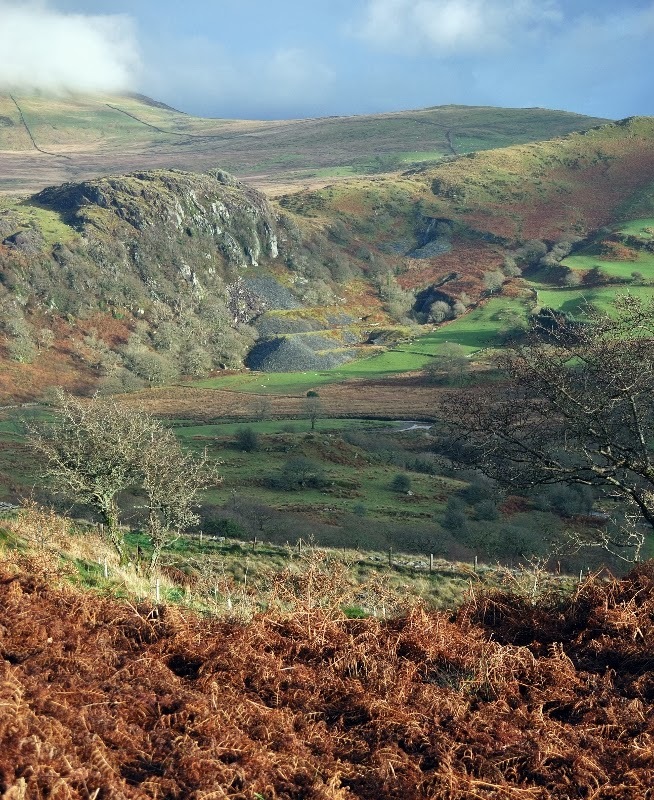 I'm always glad to reach the ridge on one of the flanking hills and look down on the cwm, where I can appreciate it's beauty without being spooked by the atmosphere. 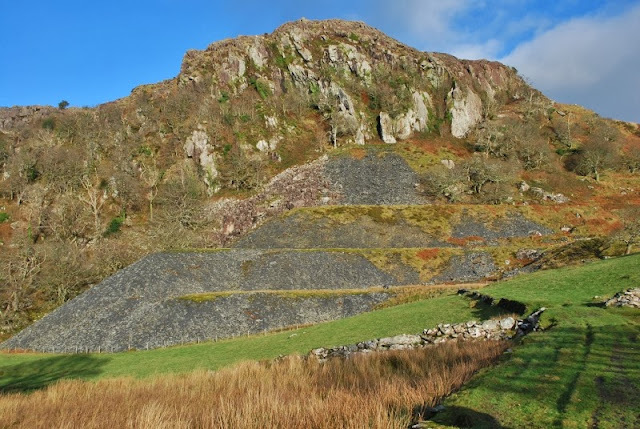 Isallt slate quarry, or Chwarel y Llan, lies on the ramparts of Craig Isallt in Llanfihangel-y-Pennant, where the valley spreads wide and the Dwyfor meanders. The course of an old tramway runs towards the quarry and can be traced the whole length. The first part is on a footpath, while the rest is on private farmland. 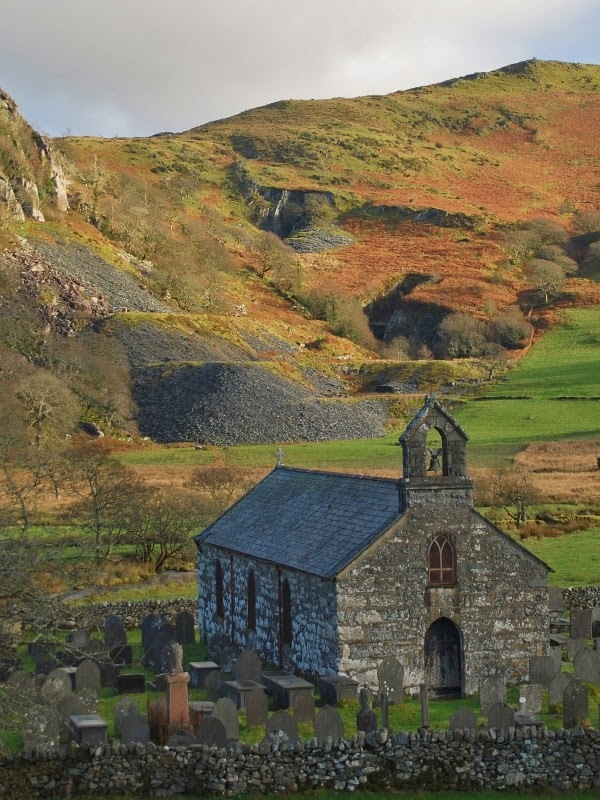 The little church of Llanfihangel-y-Pennant can be viewed to the north and is visible the whole way along, as are the workings of the Hendre Ddu and Moelfre quarries on the West side of the cwm. The tramway is well-engineered and revetted, making a very pleasant walk. I was worried that our presence might attract approbrium from one of the farms that overlook the valley from the slopes above, but I needn't have worried on that score, like most houses in this cwm, they are owned by folk from elsewhere and lie empty or are occupied by holidaymakers for most of the year. 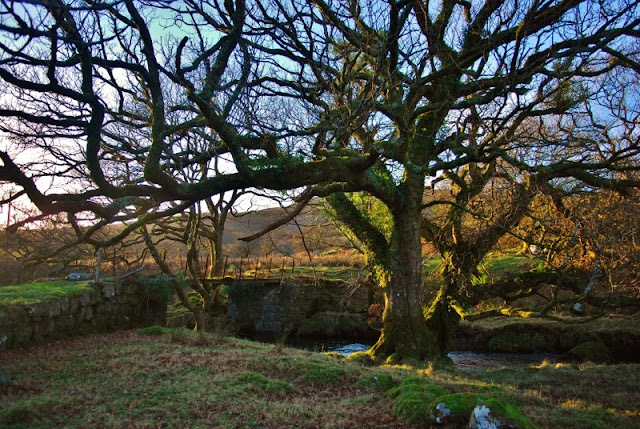 Yet the landscape has a rich social history, full of stories and memories. 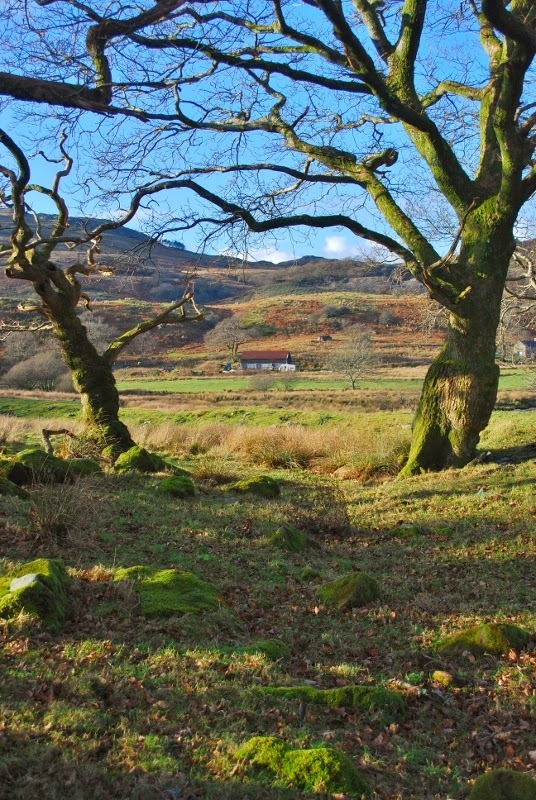 I feel that it is sad that these are not recorded, that the folk who lived and worked here are forgotten, their dwellings and steadings swallowed up by subsidy seekers and speculators.One such is Isallt Fawr farm house, dating from 1570. It appears in a web-site for country cottages. Among the guff intended to lure the visitor (as if any was needed) there is the emolluent note that the "surrounding land is organically farmed". Well, I'm glad that visitors get to enjoy the landscape and stay for a while here, far away from their labours in the city; that's some consolation. But it feels wrong, all the same, that these places are not lived in by local people working the land. I know, the visitors contribute to the local money supply, and coming from a hill-farming family I know well enough the problems of subsisting in a hostile economic environment. I'm just saying, that's all. 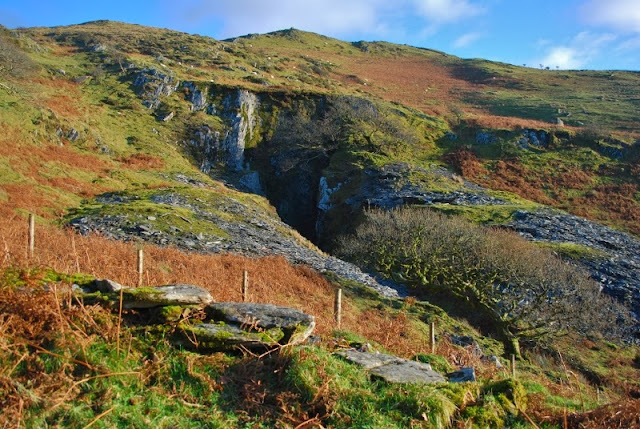 Interesting to note that at the nose of the topmost spoil tip, the rock is different. Normally exploration/overburden is at the base of a tip; perhaps there was a fall? Back to the quarry. 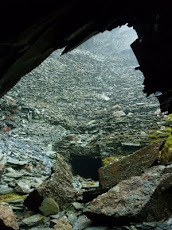 There are impressive tips and two pits, the lower one flooded and full of trees, making it difficult to photograph. Tip tramways run from both pits, although I couldn't find much evidence of the incline that Richards (a) mentions. The mill area has been robbed of stone, the foundations of a weigh-house betraying where the lower pit tunnel must have opened out to daylight. Wilkinson's Gazetteer mentions a date of 1847 but further records are not forthcoming. There is nothing to tell us who worked there, although parish records and census results would probably yield information. View from the upper level: The tramway snakes away towards the road. The upper levels present spectacular views, but the ground is infested with brambles, making progress hazardous to clothing. While negotiating the highest levels, I became aware of sheep looking down on us from the crags above. A fence had been made to protect them, among the wind harried rocks of the ridge. I felt that it must have been a labour of love to drive those posts in to the sparse purchase up there; that farmer must really care for the animals in his or her charge. The tunnel to the upper pit was run-in, but the climb was worth it as the setting sun bathed the cwm in burnished gold. We descended very carefully and made our way back to the road as the gloaming deepened the mystery of this strange, yet beautiful place. 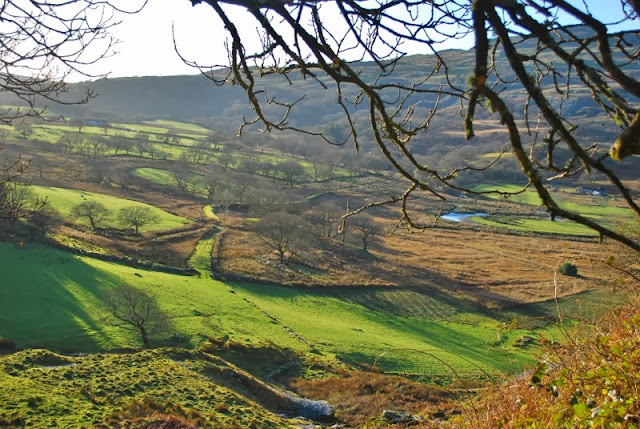 "Owen, David [Dafydd y Garreg Wen] (1711/1712-1741), harper, was the son of Owen Humphreys and his wife, Gwen Roberts of Isallt Fawr, Llanfihangel-y-Pennant, Caernarvonshire, a member of a family that was traditionally believed to be descended from the physicians of Myddfai. " 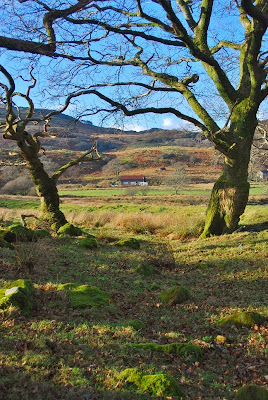 The above is interesting in that it is noted on the cottage rental site that between them, the Roberts and Owen families of Isallt Fawr produced over 100 doctors and surgeons. The same site notes that J.B.Priestley once stayed at the farm. William Meirion Evans, Wesleyan minister and editor, was born on 12 August 1826 at Isallt Fawr. He emigrated to Australia and was significant figure in championing the use of the Welsh language. The Welsh church he founded in Melbourne city centre is still there and conducts two services a month in Welsh and it's Sunday school continues the tradition of holding classes in spoken and written Welsh. A classic Porthmadog "Western Ocean Yacht", built in 1909, was part-owned by Doctor Robert Roberts, of Blaenau Ffestiniog, whose ancestral home was Isallt Fawr. The ship was a slate trader, although there is no evidence that she ever carried Isallt slate or whether there was any closer tie with the quarry. She was lost in 1947 off the coast of Ireland. 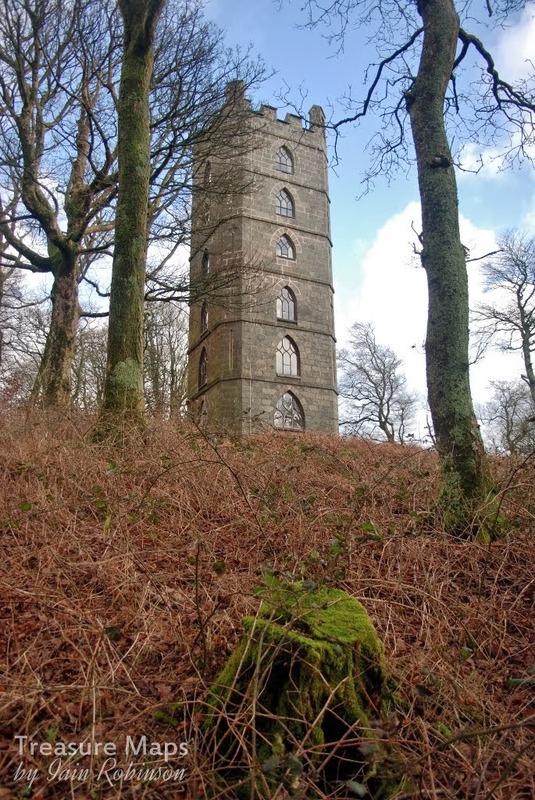 (b) The 6-story Gothic tower was built in 1821, by Sir Joseph Huddart, who lived at the nearby Brinkir house between 1812 and 1841. He was a high sheriff of Caernarfonshire and was knighted (on the Britannia Bridge!) for building the tower to welcome the Prince of Wales to the area. If true, that's a whole new level of cyri o blaid... but some accounts say that the tower was built during a spell of "work creation" for men who had fought in the Napoleonic wars, which at least allows me to think more warmly of the man. Tramway bridge, now a footpath, over the river. IÄm not entirely sure about the local rules, but it seems that it is more difficult to gewt a 'second home' by buying a farm here: there is certainly a farmhouse nearby that is empty because to live there you have to earn money on site. I'm not sure how much of the total income of any resident would have to be to remain there, but it is clearly no allowed to just live there and commute. The problem in that case is that there isn't enough land to 'economically' run a farm there (and probably make enough money for all the trappings considered 'normal' by our culture). In my more romantic moments I've ofetn thought it would be a good place for a theatre/art centre: there is space for an outdoor stage and a gallery in a barn and it is well away from the next buildings. Unfortunately the building would be rather expensive to rennovate as it is rather old. In the Former East Germany there are lots of empty houses, to the extent that the local governmants have been know to give them away if you are willing to live there for five years and not rent them out after that. Sounds a good idea, but I'm not sure I'd wan to live there. I may blog on this at some point. That's very interesting, Andy, I look forward to hearing more about that. They were talking about having a rule that you had to live here for ten years before you could buy another property, but right-wing changes in government have modified it to the point where it is not effective any more. I speak with some authority as I live in a hamlet of four houses and three are empty almost all year. One was put on the market recently but the owners wanted far too much for it; after lying dormant for several months, they gave up. They kid themselves that they are socialists, too!! Hmm. The trouble with that is it would probably push prices up even more, as well as making it hard for people wanting to genuinely live locally. Perhaps saying you have to be resident locally, or work within fifteen miles of the house would help? Funny how often we claim to subscribe to an idea but don't live it out in the everyday.